PAX East is an annual convention held in Boston, MA that caters to gamers and fans of nerd culture. This year it takes place on April 5-8. 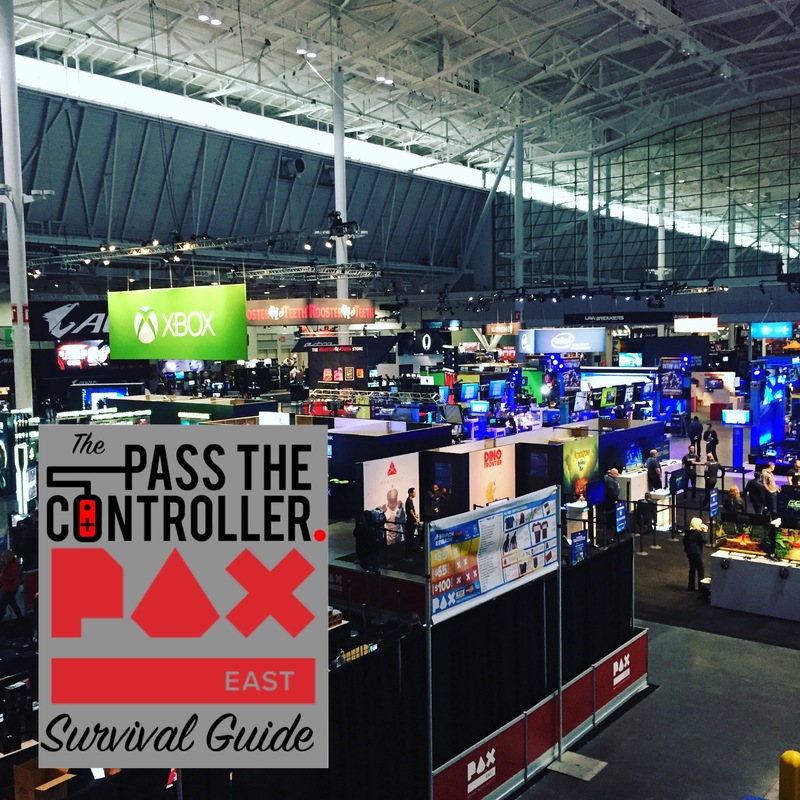 PAX East 2018 is just a few short weeks away and if you haven’t already started planning, the next few weeks will be vital to your survival that weekend. Let’s discuss a few things that newcomers will need to know, and convention veterans can read up on to refresh their brain. It’s not mandatory to plan out every minute of your time at PAX, nor would I recommend it, but having a general idea of where you want to go and when, isn’t a bad idea. A good place to start is by looking at the weekend schedule— once it gets posted. Some people may not realize that there is more to PAX than the show floor, so it’s a good way to start thinking about what panels, concerts, and meet-ups you may want to attend. You might be thinking to yourself, “I don’t want to be making all of these notes in my phone and setting reminders,” well I don’t want you to either which is why I suggest you download the app guidebook. Guidebook is essential on all of my convention journeys. It’s easy to get swept up in the madness on the show floor and miss panels but this app allows you to see the entire schedule for PAX, set reminders, and offers a plethora of other useful tools to help make PAX less overwhelming. Not to mention, PAX usually partners with Guidebook each year to offer incentives and a mini game to hunt down QR codes around the convention. If you’ve ever attended PAX before, you know what I’m talking about. Penny Arcade doesn’t release the official attendance anymore, but it’s safe to say that it’s close to around 100,000 people all coming to do the same thing you are. So, expect to be waiting in lines for booths on the show floor and lines to get into popular panels. There are a few tips to help making the lines at PAX more bearable though. The first being the official PAX line Twitter account. Yes, there’s a Twitter account dedicated solely to the lines at PAX which will help you manage your time better and know what panels are full or are filling up. It’s also not a bad idea to follow the official PAX Twitter account for show updates. This second piece of advice is monumentally important; bring your Nintendo 3DS, PS Vita, and/or Nintendo Switch! These little wonders are great for passing the time and help make waiting seem less cumbersome. Nintendo has snuck its way into most con-goers lives simply because of Street Pass. Yes, you’re 3DS can offer valuable enjoyment when waiting in the longer lines of PAX, but there is a whole subculture dedicated to Street Passing at PAX. If you have a 3DS and have never taken it to a convention, be prepared to be glued to your screen and be mesmerized by the flashing green light. Too bad the Switch doesn’t have this feature! The only benefit to not bringing a bag into PAX East, skipping the bag check in line when you enter the BCEC. (Pro-tip: if you are worried about waiting in line to enter, the line typically tapers off around 10:45 AM). I wouldn’t recommend going bagless. You will get swag from developers on the show floor and sometimes at panels, plus you’ll want to buy stuff from the vendors– trust me you will want to buy stuff. On top of having the ability to carry the stuff you get, there are essentials you should bring into PAX with you. If you are like us, local and traveling to the convention from within the state, make sure to plan ahead. If you are planning on renting a hotel that weekend, at this point most places are booked– but if you keep checking every few days you can get lucky with room cancellations and snag one then. If you are driving your own car to the convention be aware that many of the lots at and around PAX charge between $30-$50 a day and fill up rather quickly. If you are driving in and planning on parking near the BCEC try to arrive an hour before the convention opens at a minimum. Other options for those nearby who are commuting would be to park outside of Boston and take public transportation in. There is plenty of food available at the venue on both the show floor and upstairs on the first floor and though these are viable options, con food isn’t cheap and you can usually find better value not far from the convention. Some exits have food trucks just outside and there’s a handful of restaurants nearby, so don’t be afraid to venture outside and get some fresh air while you’re at it. Also, last year Totino’s had their own lounge on the show floor pumping out unlimited pizza rolls for free and there was a free Hot-Pocket food truck too. So here’s hoping for more free food! Be aware that with the influx of convention attendees in the already saturated city of Boston, there will be wait times and long lines almost anywhere you decide to travel for food. Plan ahead, bring snacks to offset when most people are eating and choose to seek out larger meals in the off-peak hours of lunch and dinner. You know those commercials for cleaning products that show you how many germs are on the door knobs at your house just from the people that come to your house? Well picture an entire building with germs from 100,000 people swarming about. From the controllers at each developer’s booth, to the air you share with everyone at the convention, you’re going to want to make sure you stay hydrated with water, wash your hands often, especially when you use the bathroom, but you do that anyways , right? Though stepping away from PAX may seem like an unrealistic idea, make sure to take time to step outside for fresh air, and get rest during the weekend. The PAX plague is a real thing, and you don’t want it to destroy your weekend of gaming bliss– or the week after the con! Whether you’re a budding journalist (ahem) or just a fan of gaming and nerd culture, you’re going to be surrounded by people who love the exact same things you do, so use this to your advantage! There is no better place to create new connections, find another adventurer for you tabletop campaign, and if you’re lucky make some life-long friendships both on and off the screen. This one is super important. Wear comfortable shoes. You will be walking and standing for long periods of time. Everything else is up to you, just dress comfortably. Remember though, you’re going to be surrounded by thousands of people, so even if the weather in Boston is cold, the venue will probably be pretty warm. Pro-tip: don’t forget to wear deodorant. (No, seriously don’t forget). This is another one of those plan ahead moments, seeing as how most of these are free ticketed events that “sell out” before PAX weekend arrives. A good place to look for updates on any announced after parties is the PAX forumns, there will usually be a thread dedicated to all of the afterparties. There are plenty of outside events that go on like bar-crawls, pinny-trading meetups, and tabletop tournaments. We will be involved with something unannounced this year so make sure to stay tuned to our Twitter, Instagram, and everywhere else you might see us to stay in the know! The cosplay at PAX is top notch. The con-goers who choose to dress up do it passionately and usually devote massive amounts of time to perfecting their costumes. Please remember to always ask before taking pictures. I have never had anyone ever turn me down for a picture, nor have I ever seen someone get turned down. Just be polite and respectful. Cosplayers are partly doing what they love so you can enjoy it and take pictures of or with if you like, but never should they be disrespected in anyway. PAX East is a monster. It’ll rock you, it’ll leave you feeling exhausted, as well as excited for the next year. Make sure you enjoy yourself and that you’re kind to others. If you see us make sure to say hello!